I am a speech and language therapist (SLT) working in a residential provision for young people with autism spectrum disorder, learning disabilities and other co-occurring difficulties. We support young people from 7 up to the age of 20. Many of the young people are in a ‘grey area’ with a view to capacity assessments, including those aged 16-18. We support many capacity assessments, including deputy-ship for finances and care, health and welfare, as well as more individualised capacity assessments around restrictions in the environment, consent to medical interventions and making decisions about the future. 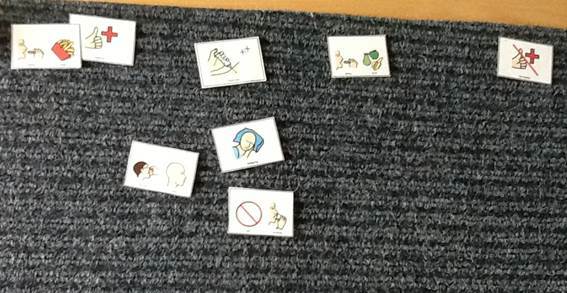 A large part of the way we support these capacity assessments is by using Talking Mats, which support people with autism who generally prefer to think about things visually. 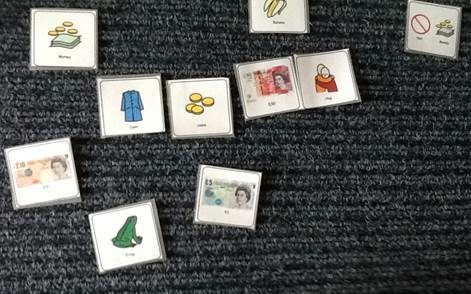 The young people are encouraged to use Talking Mats in their everyday communication, such as evaluating activities, lessons and therapy sessions to develop their skills, as well as during direct Speech and Language Therapy work. If a young person has proven their competence using a Talking Mat, we can then move on to supporting capacity assessments. 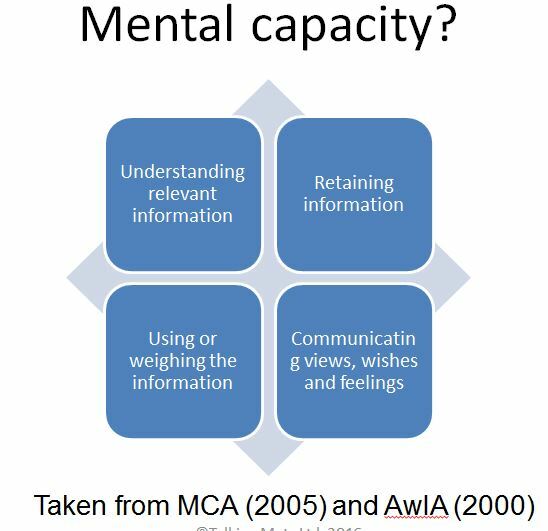 As part of the process, the SLT would break down the concepts needed to be understood to identify if the individual has capacity or not. For example with finances, do they know what money is? can they organise things that are expensive and cheap? can they put items in a scale of least to most expensive? This would all be done using a Talking Mat, then followed up if they achieved this task with a range of further activities. A Talking Mat can then support activities to evidence their understanding or lack of, while also giving a young person all practicable help to communicate. See below two examples of a young person thinking about 1) money to support their finances, and 2) things that are healthy or not. Talking mats are used for a range of different skills and assessments in the provision I work in, but their use for capacity assessment gives the young people the most practicable support with communication and allows for clear evidence of the person’s understanding of the concepts involved. In addition to the range of items mentioned above, we have have also discussed tattoos, physical intervention and behaviour support strategies, having a lock on an individual’s bedroom door, and understanding of fantasy and reality. Talking Mats has proved to be a truly simple but brilliant and useful tool. This entry was posted in Adult protection, Autism, Blog, Capacity, Communication difficulties, Learning disability, Participation and tagged capacity, Communication difficulties, Learning Disability, Participation, Talking Mats, Young people on August 26, 2016 by Joan Murphy. 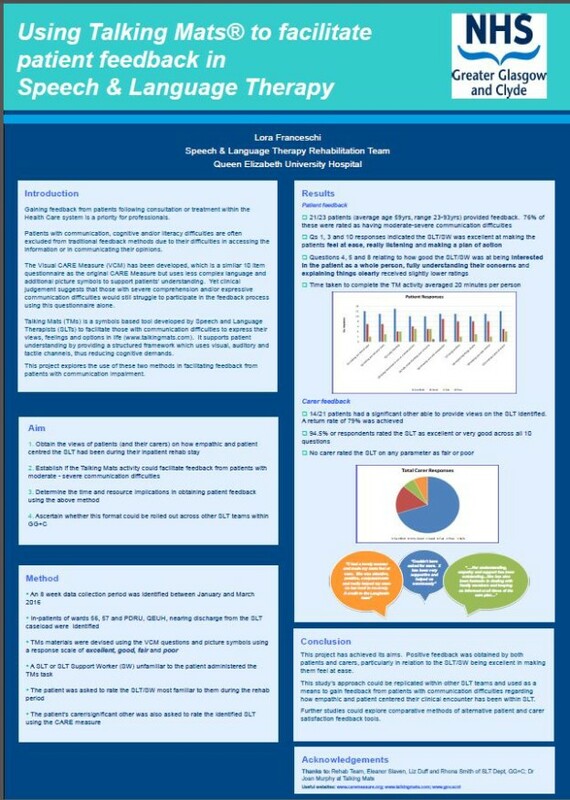 We were delighted to receive this excellent poster from Lora Franceschi who used Talking Mats and the Visual CARE Measure to facilitate patient feedback in a rehab team. Lora works with the Speech and Language Therapy Rehab Team at Queen Elizabeth University Hospital in Glasgow. These aims were all fulfilled and they concluded that this approach could be replicated with other teams and used as a means to gain feedback from patients with communication difficulties. Click here to see the full poster with their results 2016 QEUH VCM and TM. We think this is such an excellent poster that we have printed it out and put it on the wall in the Talking Mats Office. This entry was posted in Blog on August 19, 2016 by Joan Murphy. We have been exploring how Talking Mats can be used as a tool to support business – both a framework for interviews and appraisals. Because it supports reflection, it is an ideal framework for employers to use with job candidates. The recruitment process is time consuming for organisations, and any errors at this stage can be costly for teams. When I applied for the post of associate with Talking Mats I wasn’t surprised that the actual interview was engaging and different from any other interview experience. The first part was for the candidates to teach the interview panel a skill, in 5 minutes. As a speech and language therapist this made a lot of sense to me, as teaching people a skill is more empowering than merely sharing your knowledge. The second stage of the interview was using a Talking Mat to consider my levels of confidence in relation to aspects of the post. Having used Talking Mats with children and parents in my clinical work, I wasn’t used to being ‘on the other side of the mat’, and experienced first-hand the positive aspects. Firstly, it gives the interviewee permission to break eye contact. This immediately takes away the pressure of non-verbal feedback from the panel e.g. if one of the panel is smiling encouragingly, it is tempting to focus on that one person and possibly say too much. The focus being on the cards and the actual mat can reduce anxiety, supporting people to clearly express their views. Another aspect of Talking Mats is that the person interviewing, hands to the candidate a picture card on one aspect of the topic e.g. knowledge and skills. The multi sensory aspect i.e. auditory , tactile and visual, supports the candidate to focus on this one concept and share his or her reflection. The conversation is then built up and captured on an actual mat and the candidate has the opportunity to move the options on the scale as the conversation progresses. Talking Mats as a communication tool maximises the capacity of individuals to say what matters to them. How many people leave an interview feeling they didn’t say what they wanted to? P.S. I got the job! This entry was posted in Blog, Careers, Social Enterprise and tagged Social Enterprise, Talking Mats on August 12, 2016 by Rhona Matthews. We are very grateful to Lauren Pettit and her colleagues from Pretoria, South Africa for sending us their published paper on a recent research project which used Talking Mats as a research method. 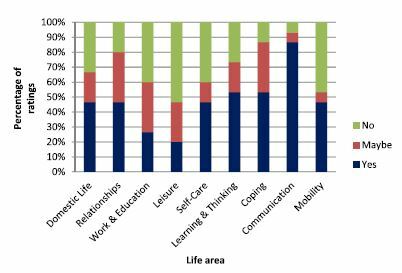 The study’s aim was to describe and compare the views of adults with aphasia, their significant others and their speech and language pathologists regarding the importance of nine life areas for the rehabilitation of adults with aphasia. They used Talking Mats to support 15 adults with expressive aphasia to rate 9 life areas in terms of importance to them. 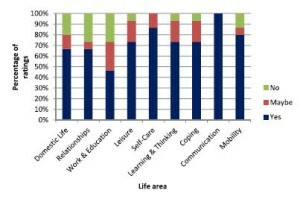 The 9 life areas they included were Domestic Life, Relationships, Work and Education, Leisure, Self-care, Learning and Thinking, Coping, Communication and Mobility. These are taken from the World Health Organisation International Classification of Functioning Disability and Health (WHO-ICF). The researchers also obtained the ratings of 15 significant others and the 15 speech and language pathologists treating them. 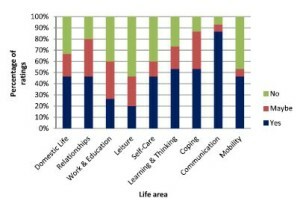 They found that most life areas were rated as important to work on in rehabilitation by most participants. 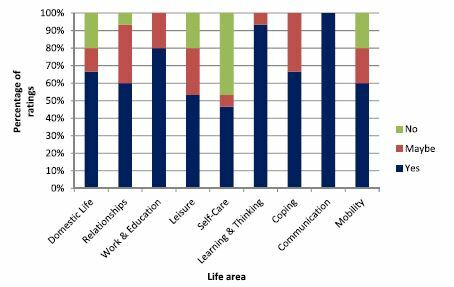 However, there were some discrepancies between the views of the adults with aphasia and the other 2 groups in the study and significant discrepancies were noted for 3 of the 9 life areas. 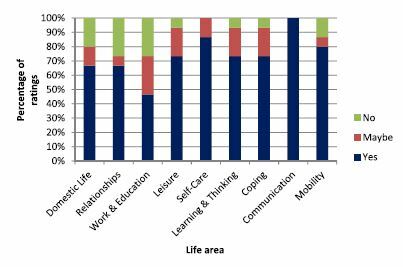 The researchers suggest that ‘These life areas can provide the ‘common language’ for team members to engage in dialogue and identify problem areas related to the daily life functioning of people with expressive aphasia. By simplifying some of the labels of the activities and participation dimensions of the WHO-ICF and pairing these labels with pictures and the interactive Talking Mats interview procedure, adults with expressive aphasia (who often have difficulty participating in the selection of rehabilitation priorities) were able to express their own views. This may be a first step in assisting the adult with aphasia to advocate for themselves and to exercise their right to identify the activities and participation opportunities which they would like to access, and to set rehabilitation priorities based on their choice. While the overlap in priorities among the three groups as found in this study is encouraging, the presence of some significant differences underlines the importance of the voice of adults with aphasia themselves. This ensures truly client-centred rehabilitation that underscores the principles of human rights and a focus on competence rather than deficits’. This entry was posted in Aphasia, Blog, Communication difficulties, Participation, Research and tagged Participation, Research, Talking Mats on August 5, 2016 by Joan Murphy.